This is an area we feel really benefits the young people because it teaches them about care, compassion and responsibility. We also see them develop in confidence and empathy, both with the animals and with other young people, staff and volunteers. The young people are involved with all aspects of our horses' daily care, including assisting in leading them in, grooming, feeding, watering, bathing and mucking out. The flock of friendly hens and our free range ducks and geese are checked, fed and watered every day and we collect their eggs twice a day. We also have a flock of sheep - a mix of Poll Dorset, Suffolk, Herdwick and Hebridean - as well as 6 Gloucester Old Spot and 7 Mangalitsa pigs which need checking and feeding every day. We are fortunate that we are able to be involved with the dairy herd at Beltonville Farm. The Ayrshire cows graze the fields around the Trust. The young people are occasionally lucky enough to see a calf being born and are able to work with the calves shortly after. Not all our animals are large. We also have our small animal area which currently houses our 6 guinea pigs and 4 rabbits. 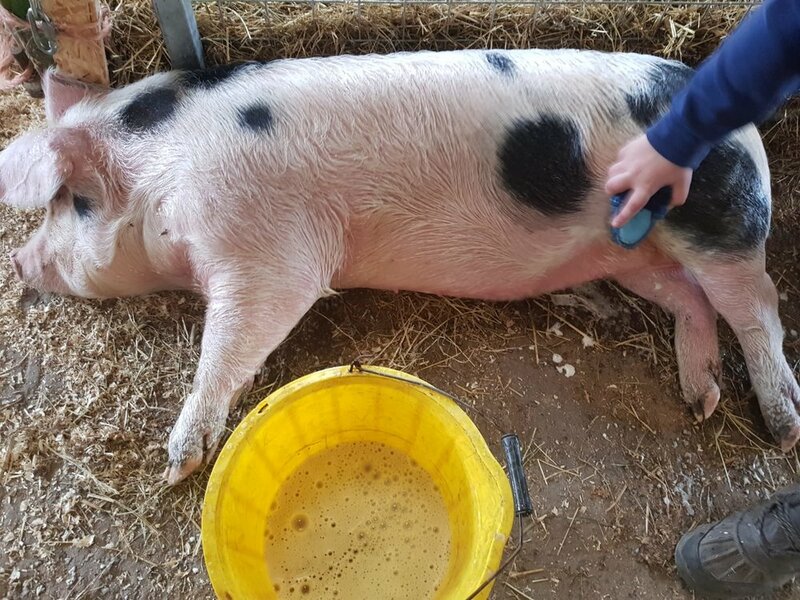 Many of the young people enjoy the peace and quiet of sitting on a hay bale, stroking one of these friendly little beasts and having some 'time out'.